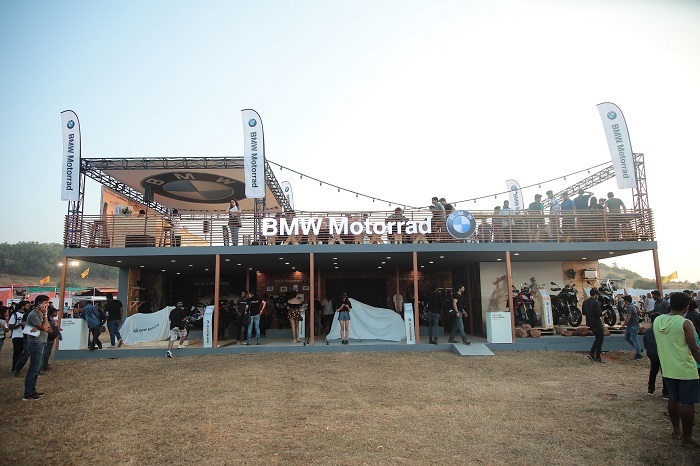 BMW Motorrad made a roaring debut at the fifth edition of India Bike Week in Goa. BMW Motorrad also elevated the excitement by launching two iconic motorcycles in India – the new BMW K 1600 B and the new BMW R nineT Racer. True to its motto - ‘Make Life a Ride’, the pavilion attracted scores of motorcycle enthusiasts and seasoned bikers to the world of BMW Motorrad – people who are looking forward to fulfil one of their dreams and create unforgettable moments in their life. No matter how different is the experience world – Sports, Tour, Roadster, Heritage or Adventure, every motorcyclist can find a bike of their personal preference. Located centrally and overlooking the riding track, the BMW Motorrad pavilion was created across two levels with ample space for interaction and activities. The ground level displayed 14 bikes - BMW S 1000 RR, BMW R 1200 R, BMW S 1000 R, BMW R nineT, BMW R nineT Scrambler, BMW R 1200 GS Adventure, BMW R 1200 GS, BMW S 1000 XR, BMW K 1600 GTL, BMW R 1200 RT, the new BMW K 1600 B and the new BMW R nineT Racer. The latest range of BMW Motorrad Accessories and lifestyle products was also on display. The ‘R nine Café Bar’ and VIP zone on the terrace provided a prime view of the entire event and was the perfect place to relax amidst the buzz. Motorcycling enthusiasts and customers also made great use of the opportunity to engage with BMW Motorrad product specialists and receive expert advice on products and services. The ‘BMW Motorrad Beer Garden’ near the main event stage turned into a vibrant meeting point for motorcyclists to share their passion with like-minded riders. BMW Motorrad customers from across the country participated in India Bike Week 2017. On the first day, the group rode out together on an exclusive ‘BMW Motorrad Ride-in’. Riding from Candolim to Vagator, the cavalcade created excitement through the city, marking the official opening of the BMW Motorrad Pavilion. The winners of the first BMW Motorrad International GS Trophy qualifier held in India were also present at the event and were felicitated for their achievements. Mr. Sanket Shanbhag from Satara, Mr. Suprej Venkat from Coimbatore and Mr. Winston Lee from Mumbai will go on to enter the BMW Motorrad International GS Trophy Finals in Mongolia in 2018. The new BMW K 1600 B or the ‘Bagger’ is the motorcycle for those who enjoy the journey more than the destination. With extraordinary running smoothness and impressive power development, it makes every ride comfortable no matter how long it is. The bike becomes one with the road in the typical Bagger silhouette: the chopped windscreen and the striking rear ensure an unmistakeable appearance. Behind its good looks is a great deal of innovative technology and a high level of comfort. The new BMW R nine T Racer.